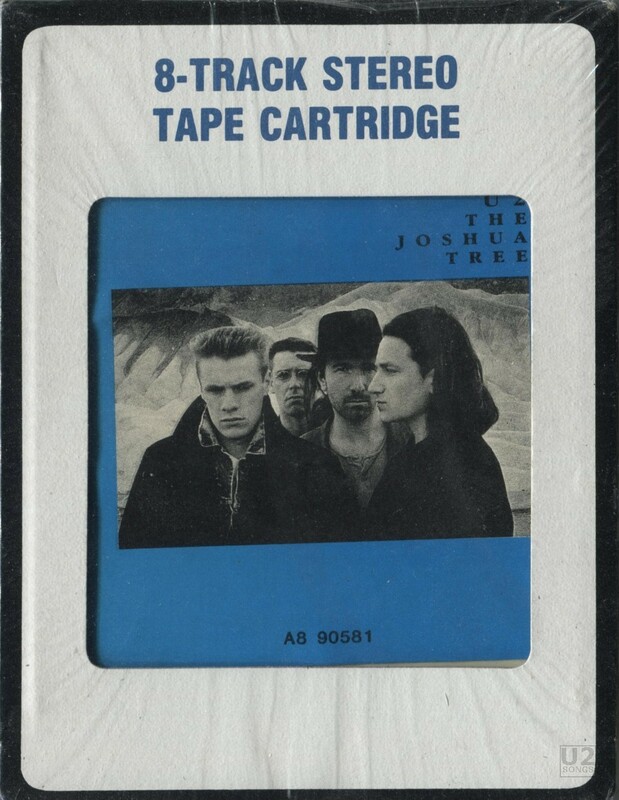 We have gotten some questions about our recent story on the different covers used for The Joshua Tree album, including a lot of interest in the appearance of a picture of The Joshua Tree on 8-Track Cassette. 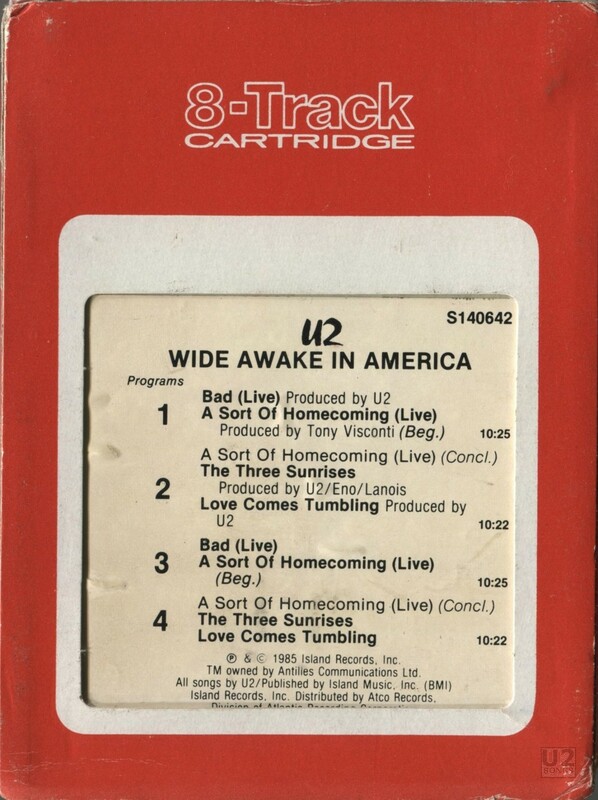 We hope to answer a few of those questions in this article, including looking at other U2 releases on 8-Track Cassette. The 8-Track Cassette, or 8-Track Cartridge was a music format that was popular in North America and Central America from the mid-1960s until it was discontinued in the early 1980s. The technology was popular in North America, had a smaller success in the UK, Japan and Australia, but was almost unknown outside of these regions. The format was created in 1964 by a consortium including the Lear Jet Corporation, Ford Motor Company, General Motors, Motorola and RCA Records. The format was primarily developed to allow an audio format for playback in automobiles, as the other popular format at the time, vinyl, was too large and fragile to work well in that environment. The cassettes are a magnetic tape which is held in a plastic cassette. They have an endless loop of recording tape inside a plastic cartridge. There is a foil attached that when the cassette player sense the foil will change to the next track. 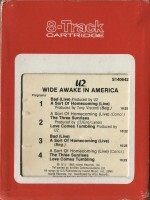 8-Tracks had a recording length of 80 minutes, and would split this among a number of tracks on the cassette. The format enjoyed popularity until the late 1970s when it began to fall out of favor as more homes adopted the compact cassette instead. My parents had an 8-Track stereo, which is what I listened to my early Sesame Street albums on. By the time I started to buy my own music, my parents had bought an adapter for the 8-track stereo to allow you to play a regular cassette in the 8-Track deck. In 1982-1984 the 8-Track disappeared from store shelves and was discontinued as a format at retail. So with the format dead by 1984, how did U2’s later albums show up in this format? The answer is the record club. There were a number of record clubs that had appeared in the 1950s. RCA’s Record Club was launched in the mid-1950s and would later be known as BMG Direct Marketing in 1987. Columbia House, CBS Records vresion of the record club was established in 1955 as the Columbia Record Club, and was later branded as Columbia House in the 1970s. The Columbia Cartridge Club, selling 8-track cassettes first appeared in 1966. The record clubs were an opportunity to order music by mail service. They would advertise in magazines, and newspapers, and would offer the delivery to your door. It was often a cheap way to obtain music, and both became very popular. But both the RCA Record Club and Columbia House were both known for something other than cheap music. They also were known for continuing to issue product in formats that were no longer being sold in commercial stores. Both continued to issue 8-Tracks long after retail stores had stopped around 1984. In fact, Fleetwood Mac’s Greatest Hits, released November 22, 1988 is thought to be the last commercial 8-track released through these record clubs. (8trackheaven.com) The record clubs also continued producing vinyl well after the format lost popularity issuing titles on vinyl up until 1992. All four U2 8-Track releases are from these record clubs. 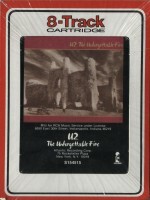 Two were released on RCA (The Unforgettable Fire, and Wide Awake in America) and two were released on Columbia House (Rattle and Hum and The Joshua Tree). 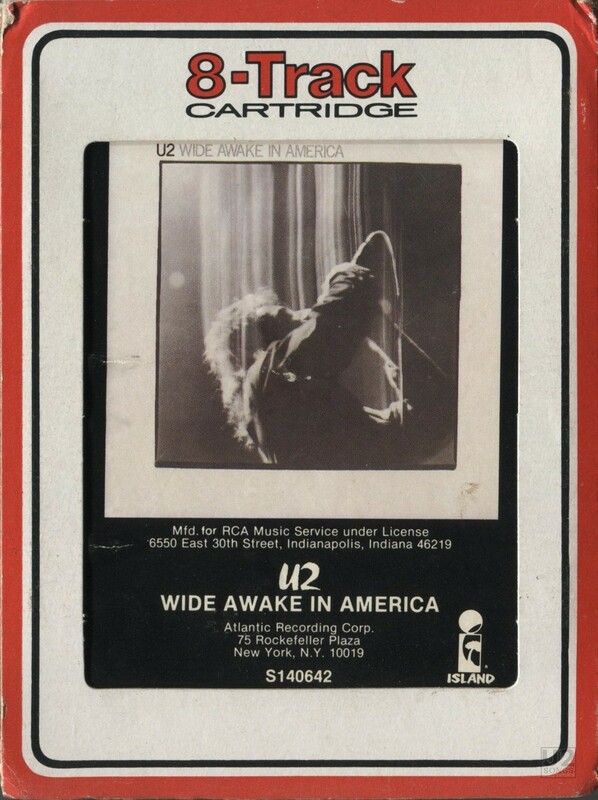 Both The Unforgettable Fire and Wide Awake in America were released at a time when RCA continued to produce a number of titles on 8-Track. 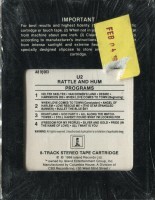 The Joshua Tree and Rattle and Hum however came out on Columbia some time later, after Columbia had started limiting 8-Tracks being produced to a monthly “Selection of the Month” title. 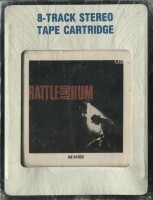 Rattle and Hum would have been among one of the final 8-Tracks produced. The 8-tracks by pop/rock acts known to be produced through 1987 and 1988? Bryan Adams’ Into the Fire, David Bowie’s Never Let Me Down, The Cars’ Door to Door, Chicago’s XIX, Dire Straits’ Money for Nothing, Fleetwood Mac’s Tango in the Night and Greatest Hits, Sammy Hagar’s Sammy Hagar, Hall and Oates’ Oooh Yeah, Heart’s Bad Animals, Billy Idol’s Whiplash Smile and Vital Idol, Michael Jackson’s Bad, Billy Joel’s Kollept, Journey’s Raised on Radio and Greatest Hits, Huey Lewis and the News’ Small World, Madonna’s Who’s That Girl and You Can Dance, Richard Marx’s self titled album, Billy Ocean’s Tear Down the Walls, Roy Orbison’s In Dreams, Prince’s Sign o’ The Times, REO Speedwagon’s Live as We Know, Carly Simon’s Coming Around Again, Squeeze’s Music from the Edge of Heaven, Tina Turner’s Tina Live in Europe, Dionne Warwick’s Reservations for Two, Bruce Willis’ The Return of Bruno, and Steve Winwood’s Roll With it. A number of country artists were also producing 8-Tracks, and a few soundtrack titles were also made available during this period. You can see by the short list, that the number of titles being produced during that time were small. 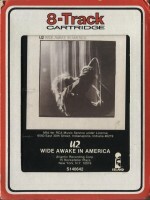 Both of the 8-Tracks for the RCA Music Club, The Unforgettable Fire and Wide Awake in America were produced in Canada. 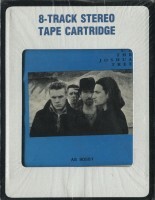 Both were released in generic RCA Music Club sleeves, and the cassettes themselves have two stickers, one on the front showing the album cover, and another one on the back that wraps around the end of the cassette listing the titles. Both the front and back stickers can be seen through a cut out in the generic sleeve. 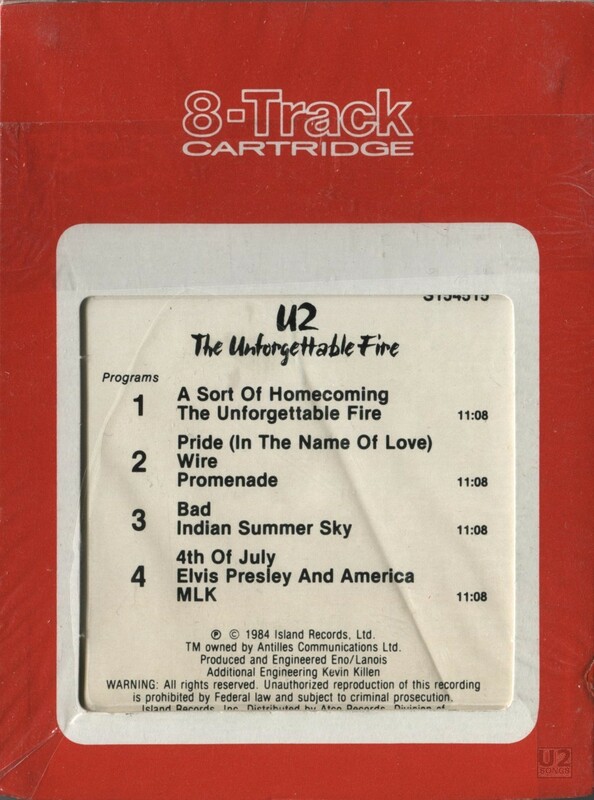 The Unforgettable Fire is labeled with catalog number S154515, and Wide Awake in America is labeled with catalog number S140542. Both of these numbers are assigned by the RCA Music Club. Wide Awake in America being such a short album was never that popular, so was likely produced in very small quantities and is the hardest of the four to find. One issue with the 8-Track is that when the cassette skips ‘tracks’ it results in a stopping of the music as it moves to the next level, and in most cases this would happen mid song. On Wide Awake in America this happens in the middle of “A Sort of Homecoming”. It happens twice to that song, as to fill in the tape, they duplicated the tracks a second time. On The Unforgettable Fire, in an attempt to avoid this, the songs have been reorganized. The tracks do not follow the same track listing as the album. “Pride,” “Wire,” and “The Unforgettable Fire” are shuffled. “Bad,” “4th of July,” and “Indian Summer Sky” are also shuffled as you can see in the list below. 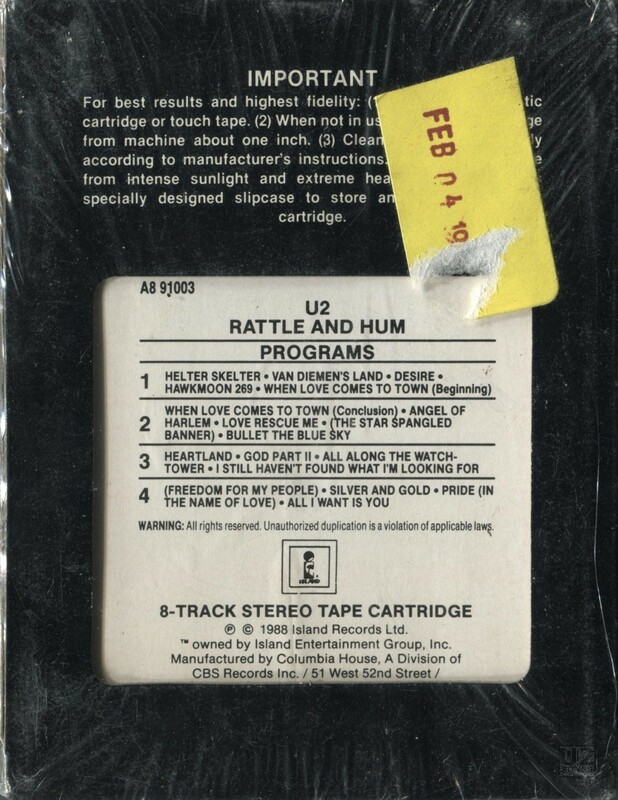 The Joshua Tree and Rattle and Hum were produced later, by Columbia House. Both of these cassettes were made in the USA and were distributed in generic Columbia House sleeves. As with the RCA releases, a window on the back and front of the sleeve allows you to see the actual sticker on the cartridge. The front sticker is applied just to the front of the cassette, while the back stick also wraps around the end of the cassette. The Joshua Tree is labelled with catalog number A8 90581, and Rattle and Hum contains the number A8 91003. 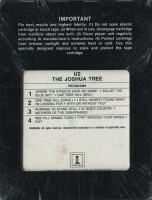 The Joshua Tree also has an interesting blue colour used in the album art, which was not seen in any other releases. 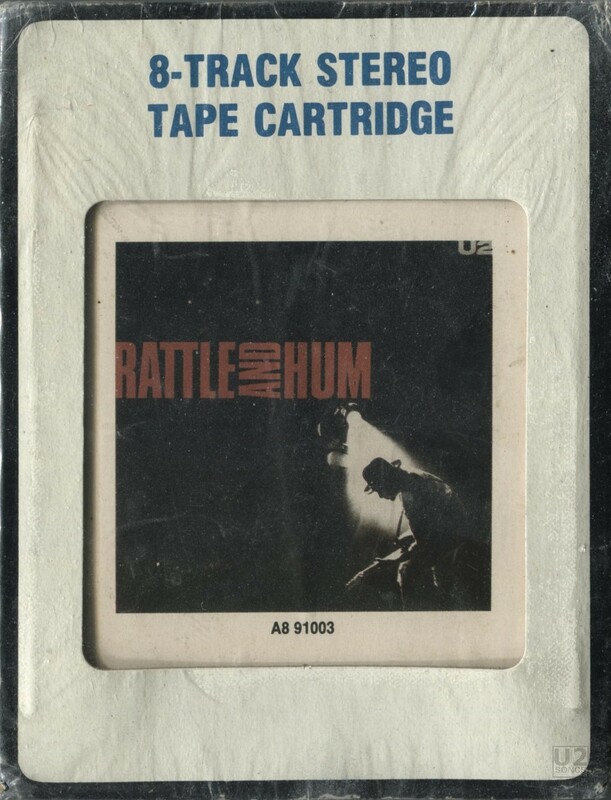 Rattle and Hum also gets reinvented for the 8-Track. Only one song gets cut in half by the track split, and that is “When Love Comes to Town” but a number of the other songs are rearranged to make this happen. The album opens normally, but the first switch comes when after “Hawkmoon 269” we hear “When Love Comes to Town” instead of “All Along the Watchtower”. 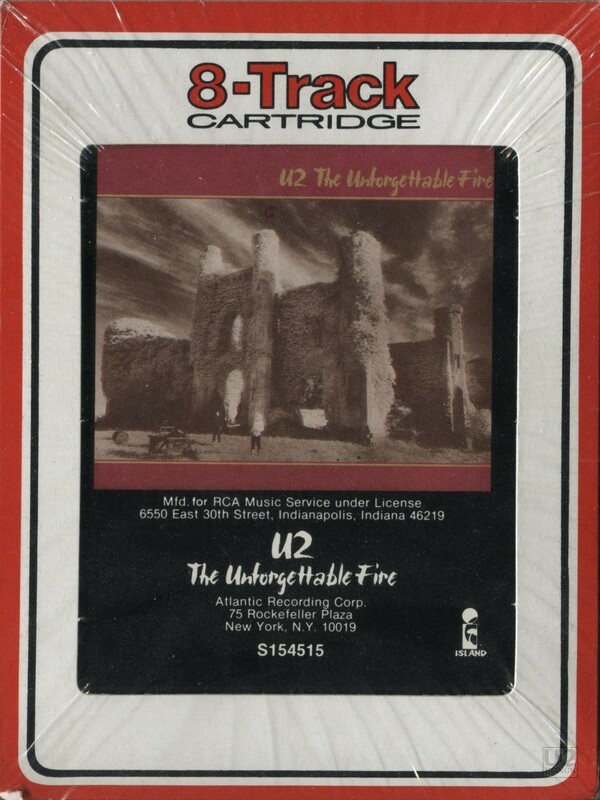 Will we ever see another 8-Track from U2? It’s highly unlikely but never say never. In recent years the Melvins and Cheap Trick have both issued limited edition versions of material on 8-Track. The format was a poor one in general, subject to wear, speed issues, and jamming. Indeed a misalignment of the head could result in the listener hearing bleed from one of the other tracks. So I’m hopeful we will never see another. That and I finally got rid of my parents 8-Track deck in 2010. But these four cassettes are a nice reminder of an earlier age. As a fan of older odd formats, these four cartridges are some of the favorite items in my collection. All four 8-Tracks released by U2 through the record clubs now tend to fetch bids in the triple figures at auction.